Reading and share top 26 famous quotes and sayings about Know Thyself by famous authors and people. Browse top 26 famous quotes and sayings about Know Thyself by most favorite authors. 2. "If only there were evil people somewhere insidiously committing evil deeds, and it were necessary only to separate them from the rest of us and destroy them. 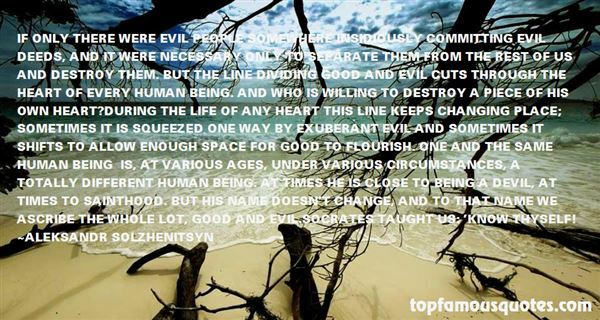 But the line dividing good and evil cuts through the heart of every human being. And who is willing to destroy a piece of his own heart?During the life of any heart this line keeps changing place; sometimes it is squeezed one way by exuberant evil and sometimes it shifts to allow enough space for good to flourish. One and the same human being is, at various ages, under various circumstances, a totally different human being. At times he is close to being a devil, at times to sainthood. But his name doesn't change, and to that name we ascribe the whole lot, good and evil.Socrates taught us: 'Know thyself!" 3. "Know then thyself, presume not God to scan,The proper study of mankind is Man.Placed on this isthmus of a middle state,A being darkly wise and rudely great:With too much knowledge for the Sceptic side,With too much weakness for the Stoic's pride,He hangs between, in doubt to act or rest;In doubt to deem himself a God or Beast;In doubt his mind or body to prefer;Born but to die, and reas'ning but to err;Alike in ignorance, his reason such,Whether he thinks too little or too much;Chaos of thought and passion, all confused;Still by himself abused or disabused;Created half to rise, and half to fall;Great lord of all things, yet a prey to all;Sole judge of truth, in endless error hurl'd;The glory, jest, and riddle of the world!" 4. "Know thyself, presume not God to scan;The proper study of mankind is man." 5. "G???? sea?t?? (gnothi seauton: know thyself.)" 6. "Man, know thyself. I say it out loud. The phrase is one of those phrases with which everyone is familiar, of which everyone acknowledges the value, and which only the most sagacious put into practice. I don't know why." 7. "A belligerent samurai, an old Japanese tale goes, once challenged a Zen master to explain the concept of heaven and hell. The monk replied with scorn, "You're nothing but a lout - I can't waste my time with the likes of you! "His very honor attacked, the samurai flew into a rage and, pulling his sword from its scabbard, yelled "I could kill you for your impertinence. ""That," the monk calmly replied, "is hell. "Startled at seeing the truth in what the master pointed out about the fury that had him in its grip, the samurai calmed down, sheathed his sword, and bowed, thanking the monk for the insight. "And that,"said the monk "is heaven. "The sudden awakening of the samurai to his own agitated state illustrates the crucial difference between being caught up in a feeling and becoming aware that you are being swept away by it. Socrates's injunction "Know thyself" speaks to the keystone of emotional intelligence: awareness of one's own feelings as they occur." 8. "To you, Fell. Can't you feel it? Inside you, as it lies inside all the Lera. Know thyself, wolf." 9. 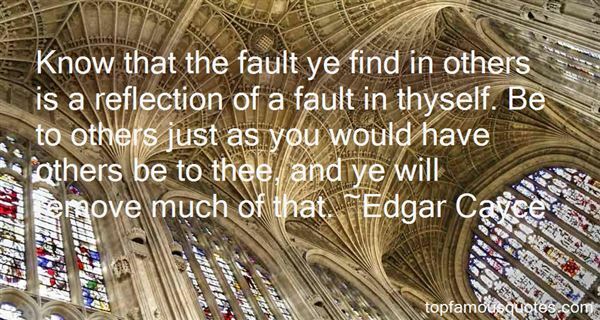 "Know that the fault ye find in others is a reflection of a fault in thyself. Be to others just as you would have others be to thee, and ye will remove much of that." 10. "All you need in life is to know thyself; to live with the knowledge that it's just life and that's the way it is. You need a sense of what your life means to you, the appreciation of yourself, your friendships and the love of others. You need a desire to grow as a person, to discover what your gifts in life are to yourself, others, and the world. You are the only you in the world. Embrace who you are...."
11. "Puck Mulligan footed featly, trilling: I HARDLY HEAR THE PURLIEU CRY OR A TOMMY TALK AS I PASS ONE BY BEFORE MY THOUGHTS BEGIN TO RUN ON F. M'CURDY ATKINSON, THE SAME THAT HAD THE WOODEN LEG AND THAT FILIBUSTERING FILIBEG THAT NEVER DARED TO SLAKE HIS DROUTH, MAGEE THAT HAD THE CHINLESS MOUTH. BEING AFRAID TO MARRY ON EARTH THEY MASTURBATED FOR ALL THEY WERE WORTH.Jest on. Know thyself." 12. "Know thyself,' said Socrates.Know thyself,' said Sappho, ‘and make sure that the Church never finds out." 13. "Know thyself? If I knew myself, I'd run away." 14. "We say to the confused, Know thyself, as if knowing yourself was not the fifth and most difficult of human arithmetical operations, we say to the apathetic, Where there's a will, there's a way, as if the brute realities of the world did not amuse themselves each day by turning that phrase on its head, we say to the indecisive, Begin at the beginning, as if beginning were the clearly visible point of a loosely wound thread and all we had to do was to keep pulling until we reached the other end, and as if, between the former and the latter, we had held in our hands a smooth, continuous thread with no knots to untie, no snarls to untangle, a complete impossibility in the life of a skein, or indeed, if we may be permitted one more stock phrase, in the skein of life." 15. 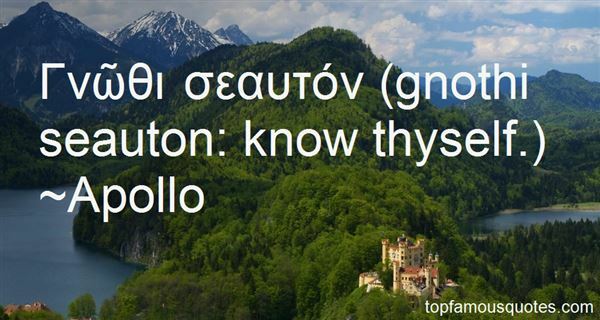 "Over the entrance to the temple at Delphi was a famous inscription: KNOW THYSELF! It reminded visitors that man must never believe himself to be more than mortal - and that no man can escape his destiny." 16. "I am not schizoid. A little manic-depressive, maybe. ""'Know thyself.'" "We try, sir." 17. "Do not judge others, without first judging yourself. There is no strength without knowing thyself. ?" 18. "'Know thyself' is a good saying, but not in all situations. In many it is better to say 'know others.'" 19. "Make it thy business to know thyself, which is the most difficult lesson in the world"
20. "My friend...care for your psyche...know thyself, for once we know ourselves, we may learn how to care for ourselves" -Socrates"
22. "Grant unto us, Lord, that we may set our hope on Thy name…and open the eyes of our hearts, that wemay know Thee. ""We beseech Thee, Lord and Master, to be our help and succour. Save those among us who are intribulation; have mercy on the lowly; lift up the fallen; show Thyself to those in need; heal the sick; turnagain the wanderers of Thy people; feed the hungry; ransom our prisoners; raise up the weak; comfortthe faint-hearted. Let all nations know that Thou art God alone, and that Jesus Christ is Thy Son, andthat we are Thy people and the sheep of Thy pasture. ""We praise Thee who art able to do these and better things than these, through Jesus Christ the HighPriest and Guardian of our souls, through whom be glory and majesty to Thee, both now andthroughout all generations, for ever and ever. Amen." 23. "One of the perks of being a psychologist is access to tools that allow you to carry out the injunction to know thyself." 24. "An humble knowledge of thyself is a surer way to God than a deep search after learning." 25. "A lowly knowledge of thyself is a surer way to God than the deep searching of a man's learnings. Not that learning is to be blamed, nor the taking account of anything that is good; but a good conscience and a holy life is better than all. And because many seek knowledge rather than good living, therefore they go astray, and bear little or no fruit." 26. "1. To account nothing of one's self, and to think always kindly and highly of others, this is great and perfect wisdom. Even shouldest thou see thy neighbour sin openly or grievously, yet thou oughtest not to reckon thyself better than he, for thou knowest not how long thou shalt keep thine integrity. All of us are weak and frail; hold thou no man more frail than thyself."